Trends are generally thought of as general likes and dislikes, but they can be difficult to predict and are sometimes fleeting. Take fashion for example. Colorful dress socks with suits is a current trend that I’m becoming more comfortable with. I’m actually enjoying wearing them (though I’m probably at the back end of that particular trend line). With direct marketing, capitalizing on trends is as important as developing sound test methodologies. They need to be captured and acted on quickly so you can leverage the opportunities for capturing new clients and, perhaps as importantly, predict when they’re fatiguing. By nature, the word ‘trend’ informs you of past performance that is used for predicting the near future. IWCO Direct works closely with our clients to study campaign results to determine what is working, what is not, and equally important, what hasn’t been tested yet. Piecing together this critical data into a test-and-learn approach is the key to success. In late December my colleague, Krista Black, made predictions for the key 2016 direct marketing trends we expected to have a big impact this year and beyond. Now that we’re more than halfway through the year, I thought it would be worthwhile to reassess them to see if they are coming to fruition, or if other trends are beginning to take center stage. Personalization, enabled by four-color variable digital print and our Dynamic Content toolset, has expanded beyond our imagination. Marketers are able to communicate to their current or potential customers through their preferred format and most importantly, with offers that are extremely relevant to each recipient. Use of mobile devices continues to rise and has become the vehicle consumers use to inquire about a product or service, learn more and respond. Direct mail needs to incorporate mobile-friendly copy to be certain consumers are pointed in the right direction. Multichannel analysis, is and will continue to be a key area of focus this year. But channel attribution continues to be challenging for marketers. Online typically gets credit for the sale, when in reality the consumer was actually motivated to inquire by a direct mail piece. We see this incorrect assessment all of the time, and it’s relatively easy to prove that direct mail is the driving force: Create a holdout group of customers that don’t receive mail and measure their online response compared to those who received a direct mail piece. Having accurate channel attribution is vital to the allocation of marketing dollars and ultimately driving increased response. We continue to see innovations in format design leading to a package rotation that keeps the customer interested. Marketers are embracing this more now than they have in the past. Consumers who receive the same direct mail piece week after week or month after month are nearly 50% less likely to respond. They think they already know what it is (despite a possibly a better offer inside), so they ignore it. Having a stable of champion formats keeps the look and feel fresh and more intriguing. IWCO Direct’s Creative and Marketing Services teams have assisted clients with this for over 15 years, leveraging best practices in design and strategies that embrace a test-and-learn methodology and innovation that is catered to finding the next new trend. Thanks in part to these trends, it’s an exciting time for the direct marketing industry. 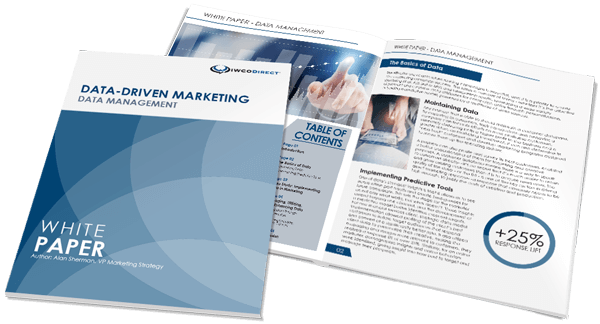 We are finally starting to see omnichannel marketing efforts in action (and delivering success); four-color digital print and dynamic content management tools are creating new levels of engagement with clients; and overall consumer confidence continues to grow.